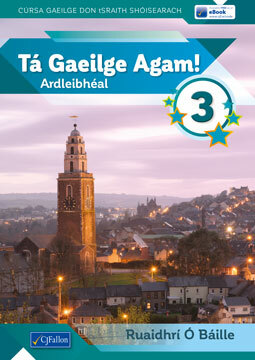 Clúdaíonn Tá Gaeilge Agam! 3 gach gné de chúrsa Gaeilge na Sraithe Sóisearaí idir theanga agus litríocht. Seo mar a fhreagraíonn leagan amach an leabhair do na trí shnáithe. Tuilleadh Treorach don tSraith Pictiúr makes the picture sequence section of the Leaving Certificate Oral Irish exam seem far less scary! The new editions of An dTuigeann Tú? – Ardteist Gnáthleibhéal and Ardleibhéal are different! They have been greatly expanded to cover all aspects of the new Leaving Certificate Irish course. Prepares Higher Level students for all aspects of the new Leaving Certificate Irish course, including both the aural and oral elements. Cúnamh (Gnáthleibhéal) is a new, comprehensive and student-friendly textbook that prepares Ordinary Level students for all aspects of the new Leaving Certificate Irish course, including both the aural and oral elements. An dTuigeann Tú Anois É? 1, 2 and 3 have been completely revised to reflect the new Aural Examination layout. Each unit mirrors the new examination format and the CDs have been revised accordingly. Scaoil Amach Arís É 1 – Eagrán Nua (Bonnleibhéal) has been revised and updated to incorporate recent changes of emphasis in the Junior Certificate examination. This popular book for Ordinary Level students has been completely revised and rewritten to update it in line with recent trends in the Junior Certificate Irish course. This popular book for Higher Level students has been completely revised and rewritten to update it in line with recent trends in the Junior Certificate Irish course. Cúrsa Gramadaí do Mheánscoileanna. Tá an saothar seo dírithe go huile agus go hiomlán ar dhaltaí meánscoile – ón gcéad bhliain ar aghaidh go dtí an séú bliain, ardleibhéal agus gnáthleibhéal. Cairde…ar an Idirlíon is a new and innovative introduction to Irish at Junior Certificate level. It is designed to cater for students during First Year and the start of Second Year. An engaging and popular novel by Ruaidhrí Ó Báille for Junior Certificate students. Gaeilge Chumarsáideach don Ardteist Fheidhmeach. This book is designed for the Leaving Certificate Ardleibhéal Irish course and prepares students for Question 1 of Paper 1, which deals with the essay. These detailed notes on the play An Triail by Máiréad Ní Ghráda are essential for Higher Level Leaving Certificate students. This autobiography is prescribed for the Leaving Certificate Irish course. This user-friendly and fully revised workbook will thoroughly prepare the student for the Foundation Level (Bonnleibhéal) examination of the Leaving Certificate. A revised edition of this popular English/Irish – Irish/English dictionary that is designed to be as clear and user-friendly as possible.